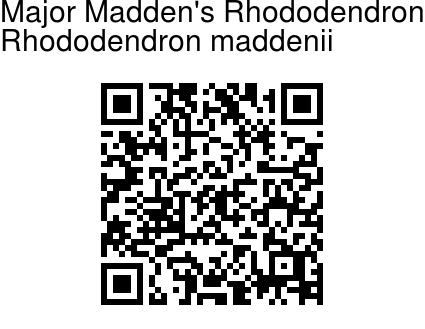 Major Madden's Rhododendron is a shrub or small tree that grows to 3-6 m in height, with leathery leaves that are lanceolate, oblong-oblanceolate, or elliptic, 5-15 by 2-8 cm in size. Leaf-stalks are grooved, 5-10 mm long. Plants produce pinkish-red floral buds and funnel shaped large white-pink fragranced flowers, 3-5 in an inflorescence. The brownish papery bark and rusty scale and branching from almost base are field identification features. Flowers are 6-8.5 cm, tube 3-5 cm, outer surface scaly, stamens 15-25, ovary 10-12-locular; style protruding, upper 1/3 with scales; stigma large, discoid. Capsules are ovoid or ellipsoid, 10-35 x 10-15 mm. 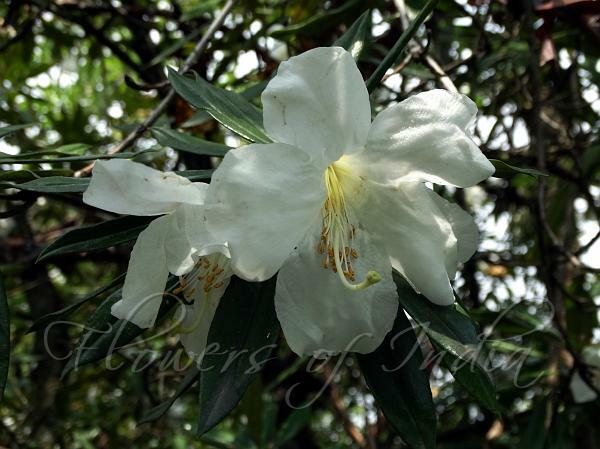 Major Madden's Rhododendron is distributed in India (Sikkim, Arunachal Pradesh and Manipur), Bhutan, NE-Myanmar, NW-Yunnan, W China to south and east into China, N Vietnam, grows in forests, scrub, and river valleys, at altitudes of 2600-3200 m.